Restuarant Reviews | Gluten Free? Gimme Three! This weekend I was really excited to finally try Masa 14 with my dad. I’d tried to get in a few times for brunch, but they book up quickly and the wait is always really long if you don’t have a reservation. 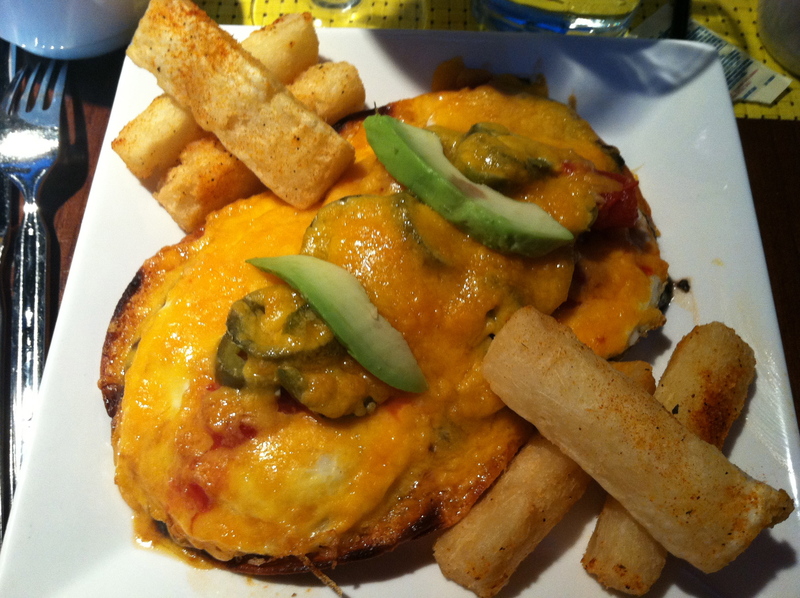 Masa 14 is a Richard Sandoval restaurant, which are are known for being gluten free-friendly. All of them have dedicated menus with clear directions on how to modify dishes to make them gluten free. Being the great dad that he is, we both ordered everything from the gluten free menu so we could share. I love yucca fries, so those were at the top of my list. On the menu it says to order them with “no chimichurri”, but I just made clear that all of the dishes we ordered should have the modifications in place, so I didn’t pay attention to every change they were supposed to make. The waitress knew that I was the gluten free one at the table and my dad did not have to be, so I guess she took some liberties with our order so he could have the gluten-containing items that were left off of the dishes. So the yucca fries are brought out by a food runner, not the waitress. There are two sauces with them, which I assume are both fine for me to eat, since we asked that all of our food to be made gluten free. 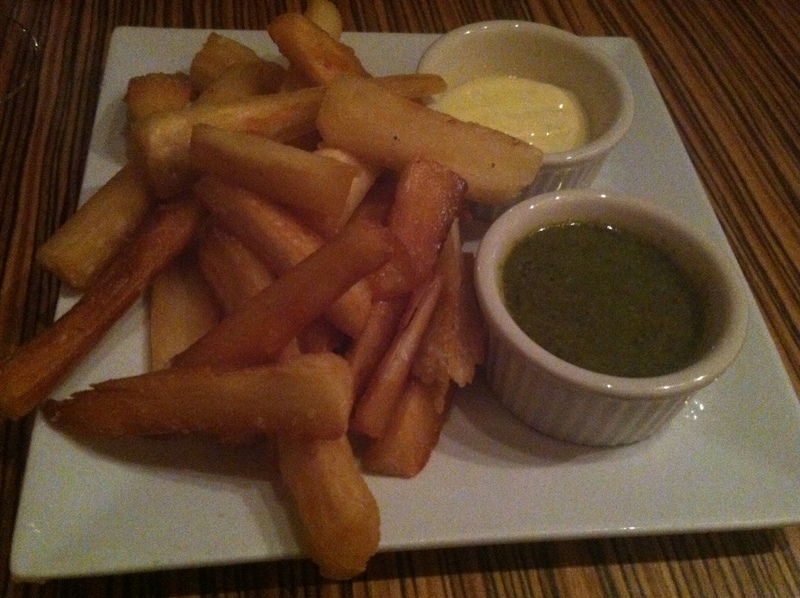 I dip a couple of yucca fries in the green sauce (which I wouldn’t have been able to identify as chimichurri anyways). Then about 10 minutes later the waitress comes over and tells me that the green sauce is not gluten free. They usually combine the sauces, but she had them separate them into two dishes so my dad could have the green one. Well, that’s just swell. Maybe you should have told us that you were bringing out gluten sauces before I had the chance to poison myself. Sometimes I wish that the signs of a glutening were more visible to the outside world. No one will see me being tired, bloated, and having stomach cramps for the next week. No one can see the damage being done to my intestines or the brain fog that seems to linger for weeks. So when the waitress asked, “Are you okay?” I just said, “I guess so…” Because what was I going to do? I already ate it. This is exactly what the celiac community has feared would happen since the “gluten free trend” has caught on. Wait staff don’t pay as close of attention and don’t take requests as seriously, and in most cases it won’t cause any consequences since they probably get a ton of orders for gluten free dishes from people who don’t actually need to eat gluten free. I’m still looking for that perfect line to convey to wait staff that I really, truly need my food to be gluten free. I’ve been thinking about something like, “If you could tell the kitchen to be extra careful with my meal I’d appreciate it. I’m not on one of those fad diets; I’ll actually get really sick if I eat anything with gluten in it.” I just hate coming off as difficult, so I usually go with a softer approach. But after something like this I might have to grow some cajones and let them know I mean business. What is your typical one-liner for wait staff to convey that you’re serious about your food being free of gluten? I went here to watch the Michigan football game, since it’s the local alumni bar. They also happen to serve Bard’s and have a gluten free menu (winning!) 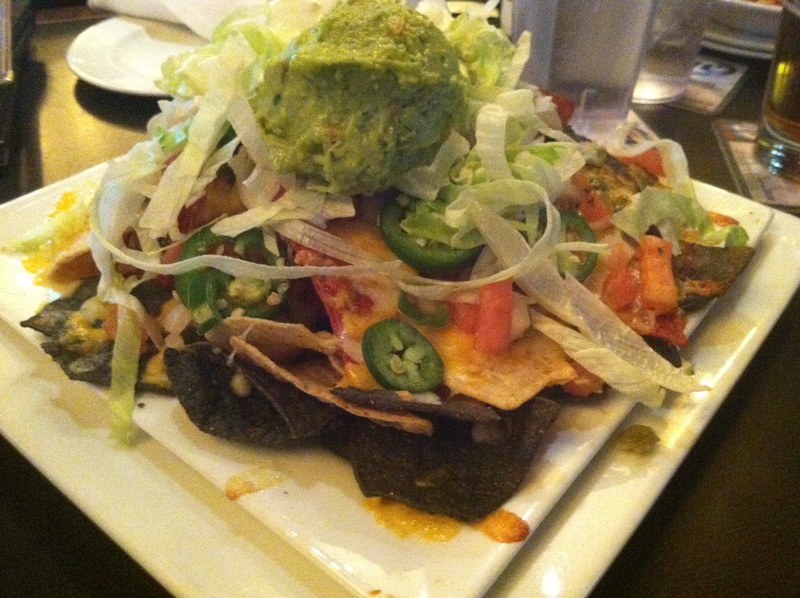 I got a huge plate of nachos, and it was the perfect way to watch a Michigan victory! This place is right up my alley: local ingredients, unique gluten free beer, and great gluten free pizza. 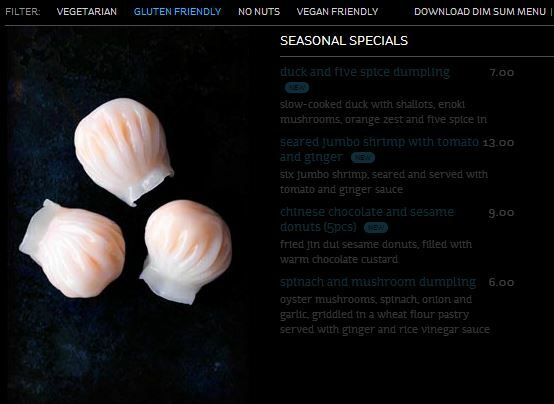 Their menu is marked with what items are gluten free. 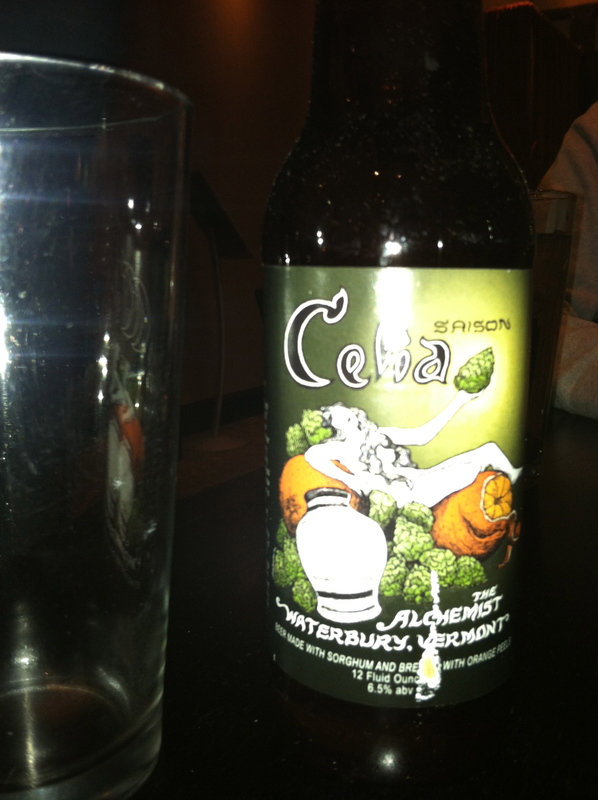 The beer I tried is called Celia, brewed by The Alchemist Brewery. Not my favorite, as it’s a sorghum beer, and therefore tastes a bit like grass. But it wasn’t horrible. The pizza was stellar though – chewy with that stone-fired taste. Although the crust was a bit burnt, I kind of liked it better that way. 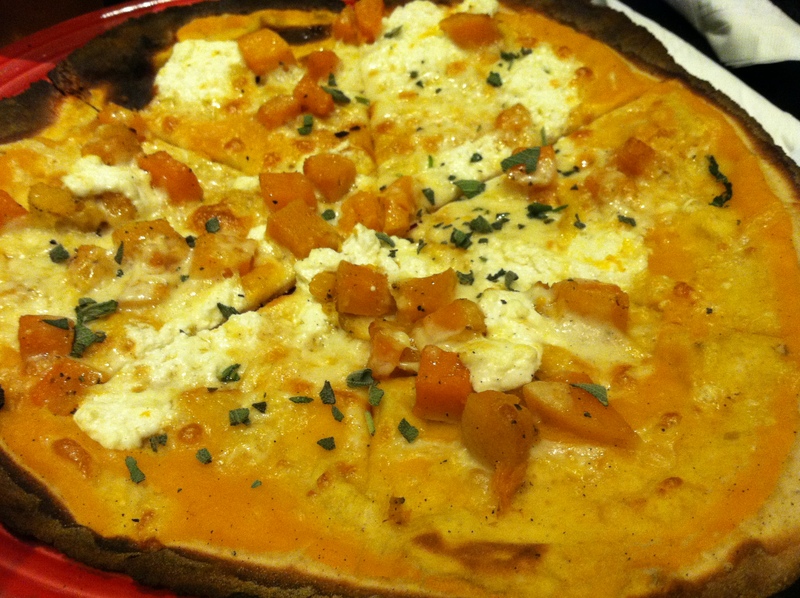 Mine was topped with a butternut squash sauce, fontina, and sage. This place served me the best lunch I’ve had in quite awhile. 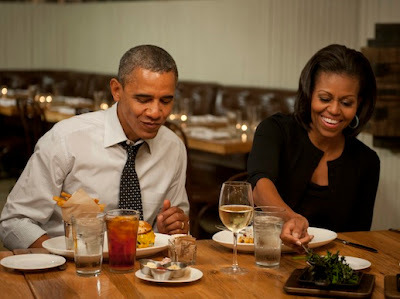 You can take any of their entrees and put it on top of brown rice or coconut rice, giving us celiacs tons of options. 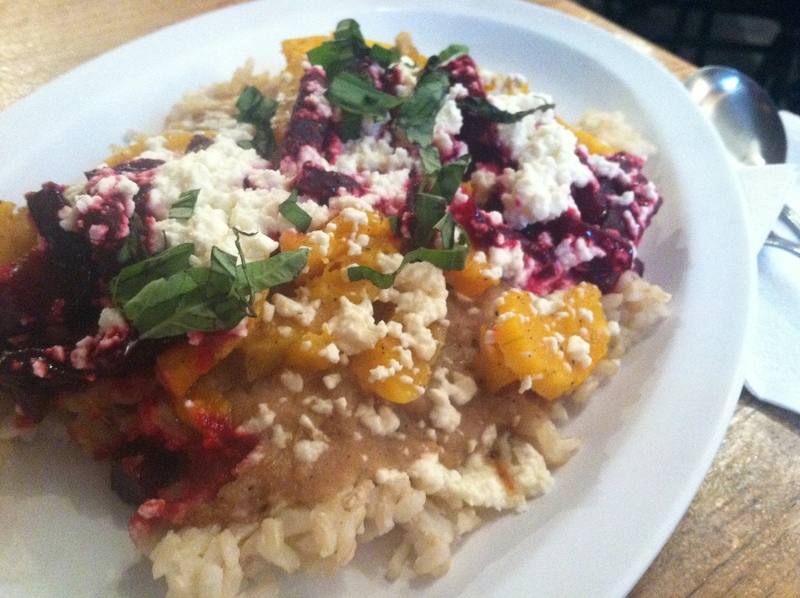 I had the weekly special, which was butternut squash, beets, feta cheese, basil, and a fennel apple puree (the real star). It came out piping hot and I scarfed it down. 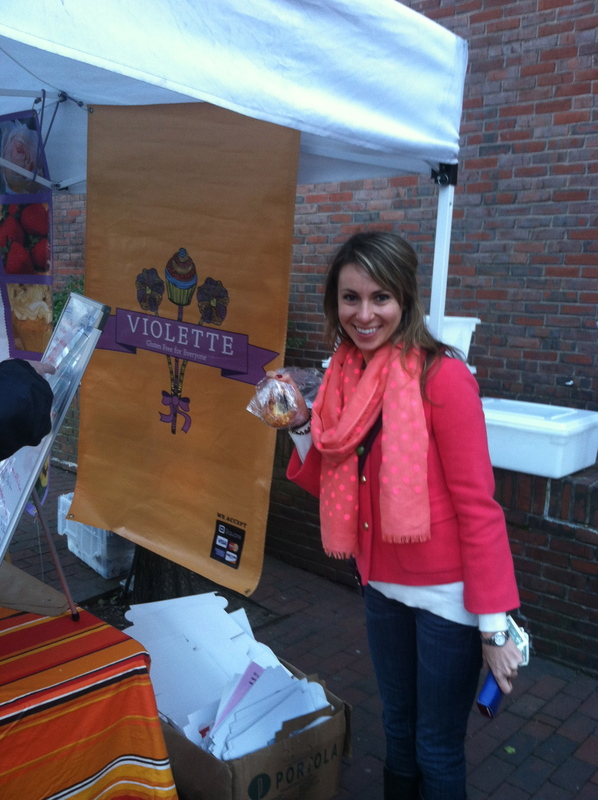 While walking around Harvard’s campus, I happened upon Violette Bakery at a farmer’s market. 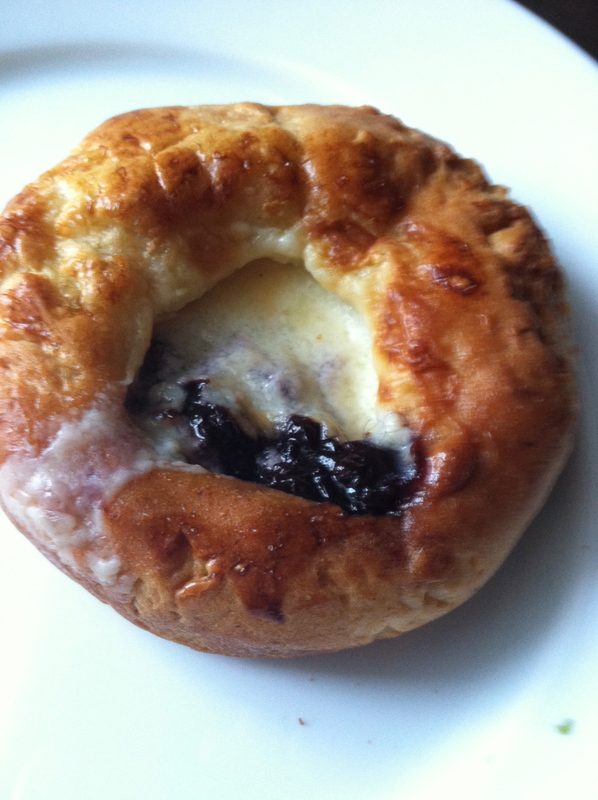 They had so many sweet and savory options, but I just had to have a gluten free danish with homemade blueberry preserves. I haven’t eaten anything like this in six years: heaven. Move over Panera, there is finally a fast/fresh lunch place that is celiac-safe! Gluten free sandwiches, pizza, and soups are all on the menu. The staff was very knowledgable and took my sandwich to a separate area to make it. I can’t say that it was the best sandwich I’ve ever had (the roll was a bit dry), but it was nice to have so many options. 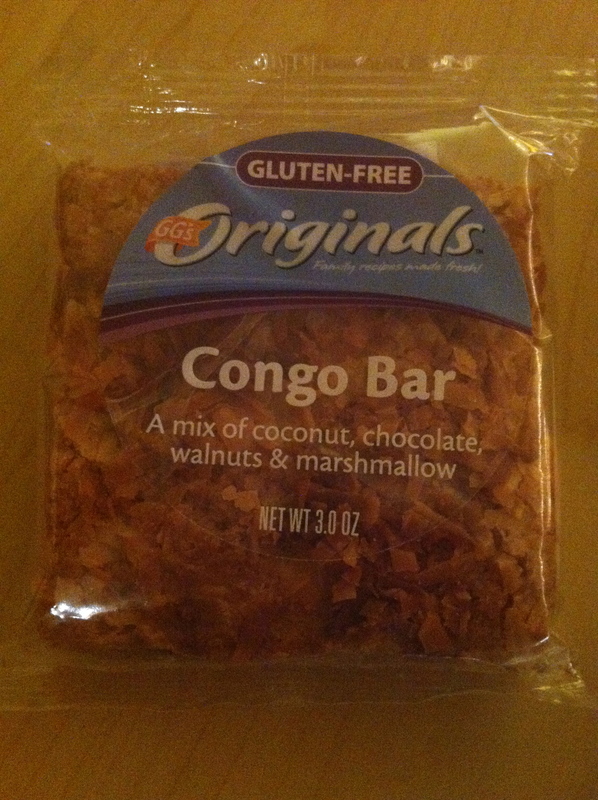 I also got a Congo Bar, which was superbly buttery and riddled with chewy, chocolatey, coconutty yummies. And thus concludes the story of how I ate my way through Boston. So much fun to try out new places! Any other recommendations of places to check out in Beantown? They have gluten free eggs benedict. Our waitress knew what was up. All you can eat. All you can drink. After getting a mimosa in hand (you can choose unlimited bloody mary’s, mimosas, champagne, and I think mixed drinks or beer as well), I informed the waitress that I can’t have gluten. She didn’t even blink an eye – just assuredly said, “No problem,” and helped me choose a few dishes. It was so extraordinary to have a waitress who was confident in her ability to navigate the menu and answer any questions I had. Pulpo is a Spanish tapas restaurant, so all of the plates are shareable. 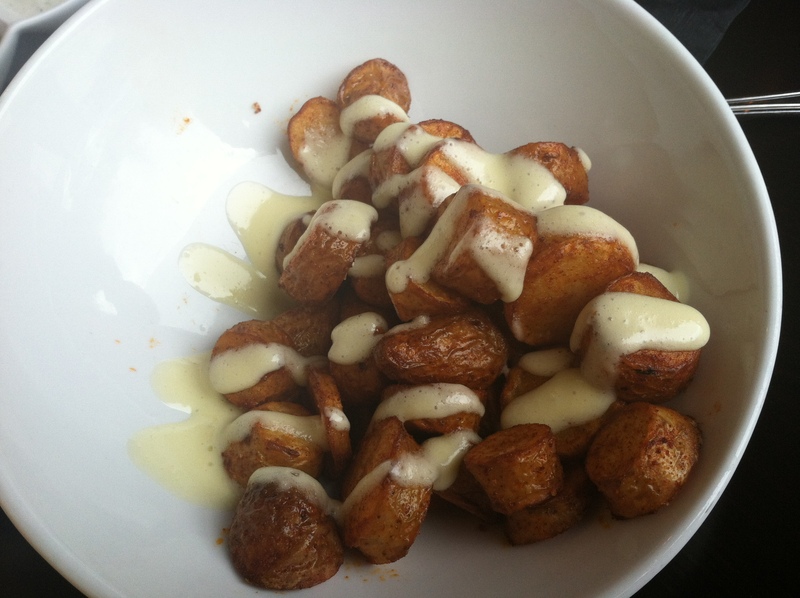 I started with patatas bravas with garlic aioli. Perfectly spiced, greasy in a good way, and there was a surprise red sauce in the bottom. Couldn’t stop eating this. 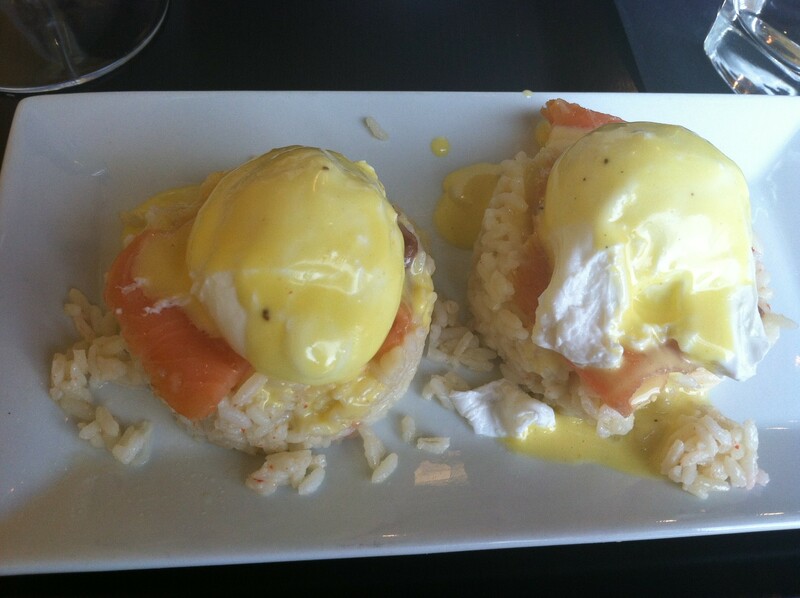 Then I ordered smoked salmon benedict. Really unique in that it’s served on a pile of soft rice, which was almost at a thick risotto-like consistency. Then the egg yolk and hollandaise mix with it and makes it really rich. To round out the meal we ordered some grilled podran peppers. 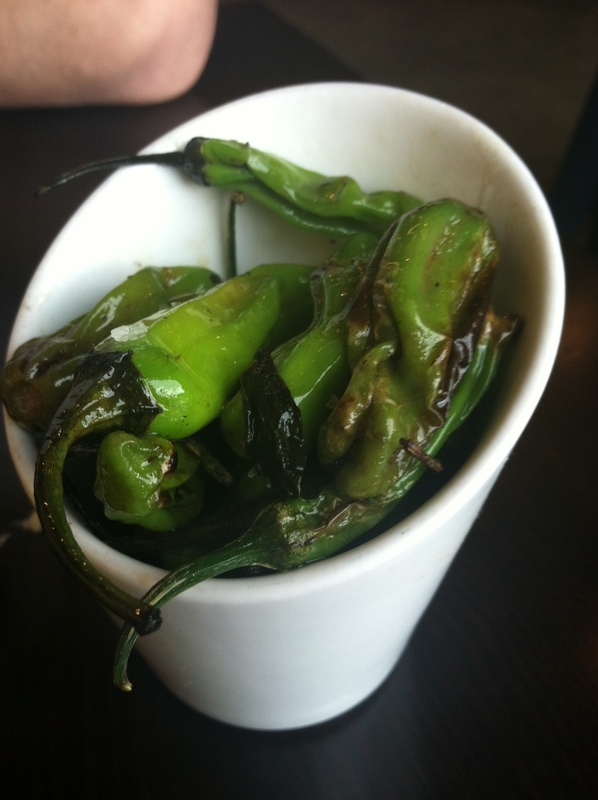 These were also served at Churchkey when I was there last, so I’m declaring them the new “it” pepper. I left with a full belly and it was worth way more than the $25 for this brunch. The laid back atmosphere, stellar service, and gluten free-friendly food will definitely bring me back here often! After a glorious Michigan victory over Michigan State this weekend, I headed to Bier Baron in Dupont for a gluten free beer. Watching your friends drink beer all day at a bar while you have mixed drinks can sure make a girl thirsty! 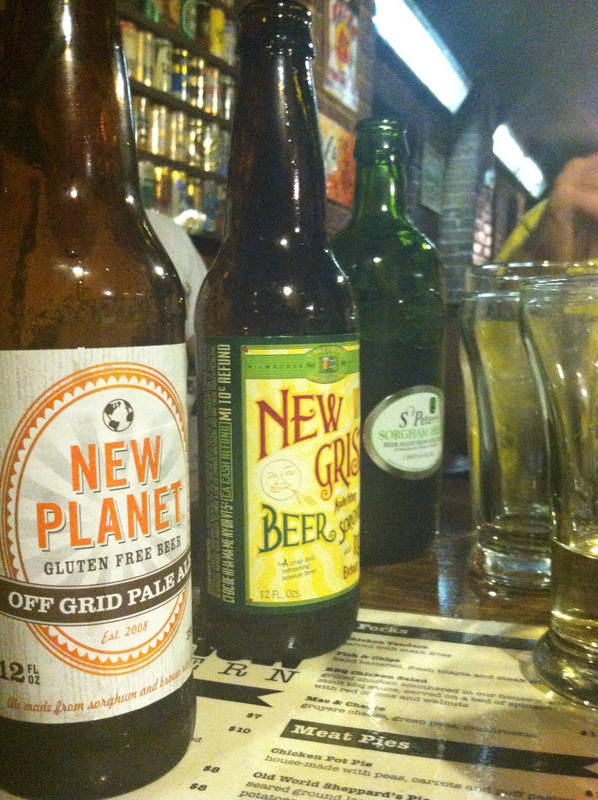 But, our awesome waiter was kind enough to bring me all three of the other gluten free beers they have, on the house! After passing them around the table, my friends confirmed that the New Planet Off Grid is kind of funky. I’ve never been a fan of New Grist, but when you have them side-by-side, it actually tastes quite like the St. Peter’s (both are sorghum based and light beers, so it makes sense). Even though I live about a five minute walk from Vace Italian Deli, I only went in once before since I only ever saw people buying pizza there. A reader tipped me off (thanks, Fede!) that they have a bunch of authentic Italian pastas that are gluten free! 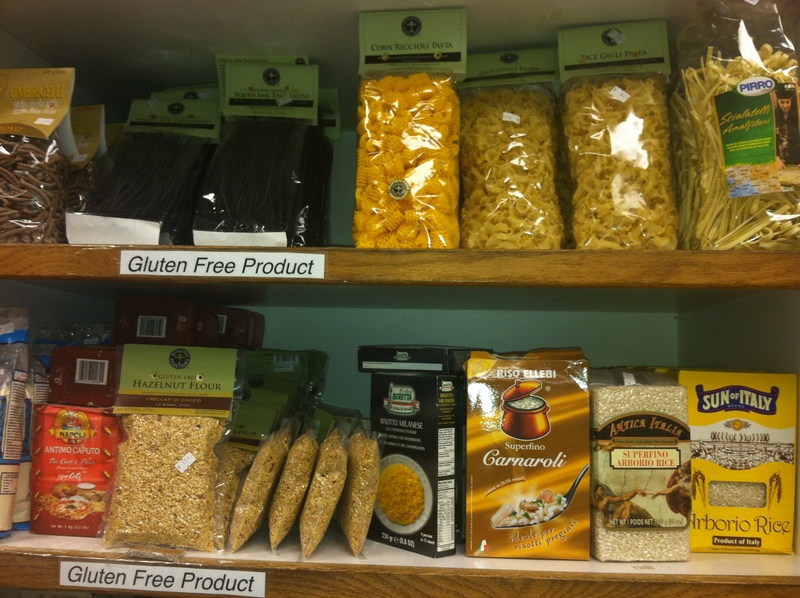 They have corn riccioli, rice gigli, and one pasta made with squid ink (plus the naturally gluten free risotto). 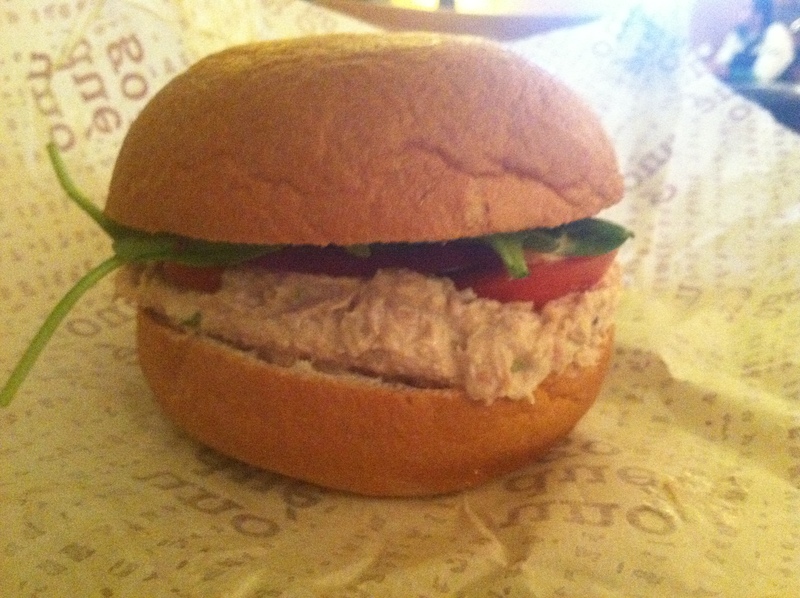 Pair one of these with a homemade sauce (they carry them fresh and frozen), and you’ve got yourself a meal! One more win for my neighborhood! I went to the last game in the NLDS series (heartbreaker), and was freezing cold and standing up for about six hours. 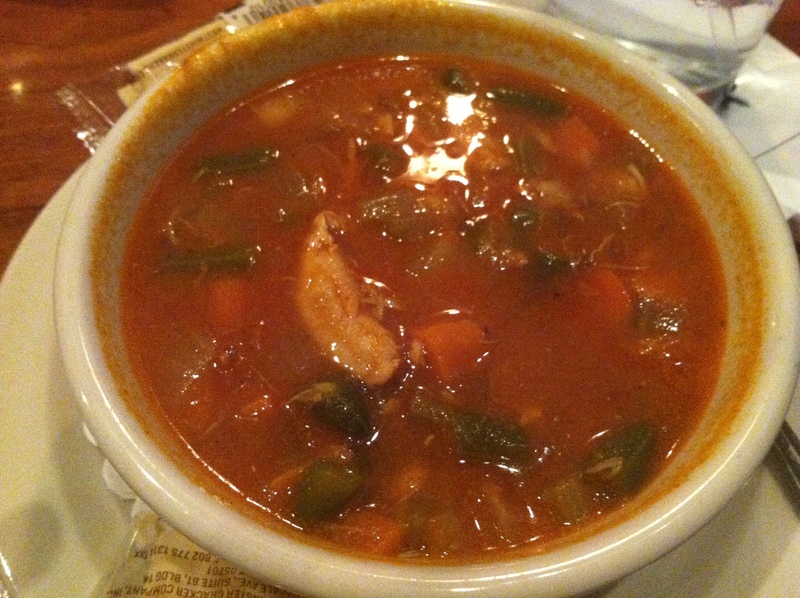 So when I got to Clyde’s in Chinatown and found out that their Maryland crab soup is gluten free, I was overjoyed. Two bowls later and I was feeling slightly better about the Nats losing, and much warmer. Just a few things happening around this great city in the gluten free realm!